London cast. Photo courtesy CB-PR and Alastair Muir. While most well known for his Broadway hits Big Fish and The Addams Family, lyricist and composer Andrew Lippa has created a wide portfolio of theatrical projects, many of which received productions at Theatreworks over the years. Life of the Party, running at the theatre company’s Mountain View venue, collects the best of Lippa’s songs in a revue tied together by his recollections of the writing process. Lippa himself is the main character of the show, performing on the piano and in song. In between numbers, he displays a ringmaster-like wit, joking around with the audience and playing on their expectations of how to behave during a concert. The production feels less like a parade of Lippa’s greatness and more like a private performance after dinner: He laughs, he jokes, and at times he’s vulnerable. The rest of the cast has serious experience: Damian Humbley worked on Sondheim shows in the West End, Teal Wicks was Elphaba in Wicked on Broadway, and Sally Ann Triplett has a number of top-level accolades to her name. The songs themselves vary from goofy to heartfelt, from innocent to raunchy, and from Lippa’s most established musicals to numbers from shows he never finished. Included near the end of the show is a preview from his adaptation of classic children’s book The Man in the Ceiling, a taste of something that might arrive at TheatreWorks in the future. There’s something for everyone in Life of the Party, whether they prefer songs with complex lyrical structure, satisfying scoring and instrumentation, or just a fun theme and jokes. Morgan Large’s set reflects the mélange of shows and influences present in the revue. Numerous objects and pictures, including a loving portrait of Lippa’s artistic idol Stephen Sondheim, decorate the multi-story shelves bracing the stage. 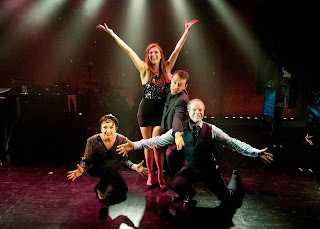 They light up when songs from their relevant show comes onstage, but even without emphasis, their presence tempts people familiar with Lippa’s work as to the numbers to come. More than anything, the technical work takes advantage of the way live theatre presents multiple places for the audience to pay attention. Life of the Party at Theatreworks collects the composing and performing talent of Andrew Lippa in a fun and glamorous revue. If you’re looking for an evening of fun without much structure, want to acquaint yourself with the works of a Bay Area musical theatre steadfast, or especially if you’re already a fan of his, the show is definitely worth checking out.